Fundraising professionals know that all donors are not the same. 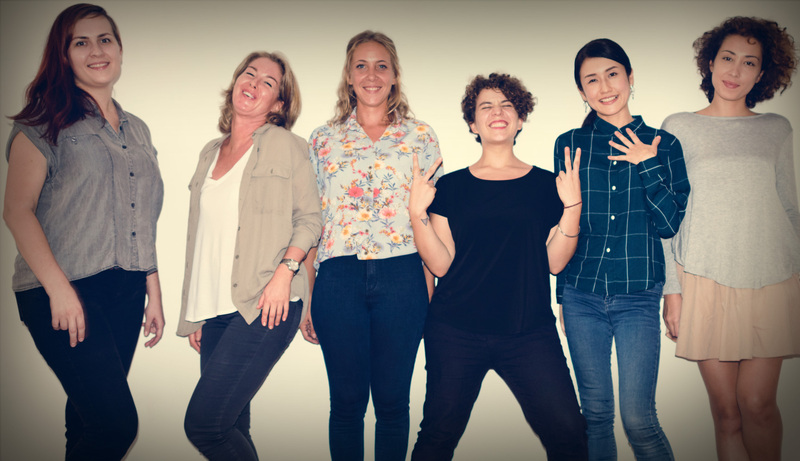 As women become even more powerful forces in supporting causes, organizations should be mindful of the trends that link female donors together. One of the best regular surveys on donor trends is the Global Trends In Giving (GTG) report. Produced annually by the Public Interest Registry and Nonprofit Tech for Good, the report surveys thousands of donors around the world, and highlights trends that range from what types of charities get the most donations, to the methods donors prefer. The report also does a detailed breakdown of male vs. female donors. Let’s take a deeper dive into the 2018 report and gain a better understanding of female-donor activity. The 2018 version, available at https://givingreport.ngo/, includes data from 6,057 donors from 119 countries. It was conducted from late April through June 2018. While the entire dataset is interesting, our breakdown will focus on two subsets: female donors—the focus of this article—North American respondents (which combines both the U.S. and Canada). Note that this doesn’t mean a U.S.-based charity should not pursue donors from around the world; in fact, the survey found that 31% of all donors gave to a cause based outside of their country. That said, gaining a detailed understanding of your most likely donors—those in your country—should be the foundation of any campaign. In the GTG survey, 65% of the respondents were female. Among GTG’s key findings; female donors were most inspired to give as a result of social media (32%), followed by email (26%) and website outreach (17%). Males, on the other hand, preferred email (30%), social media (24%) and the web (19%). 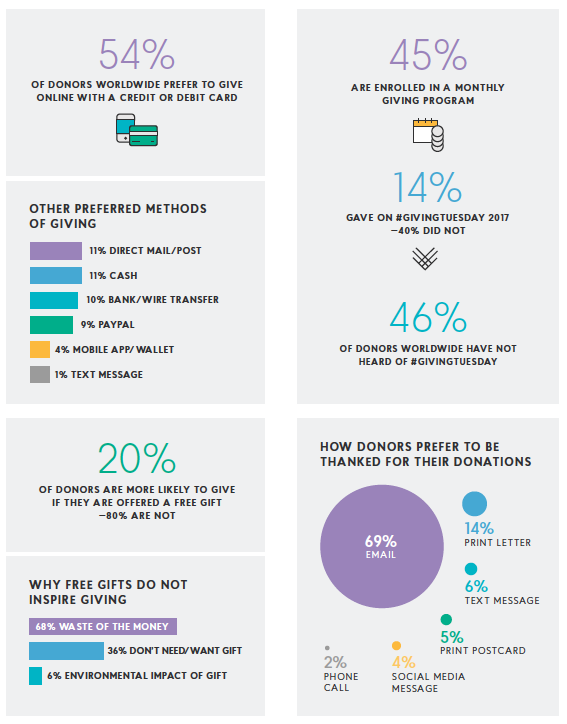 Each of these tracked closely with male donor data results except for the tribute-gift response—only 21% male donors report giving tribute gifts. Now let’s look at some key figures from the North American donor subset. While the following trends represent all North American donors, note that 70% of those respondents were females. One of the most significant takeaways: 56% of North American donors say “they are most likely to give repeatedly to an organization if they receive regular communication about the work the organization is doing and the impact that their donation is making,” the survey found. Among giving methods, 60% prefer credit card, far out-pacing the next-highest category of mailing in a donation (17%). Not surprisingly, the top five causes are tightly bunched: health and wellness (12%), children and youth (11%), animals and wildlife (9%), faith and spirituality (9%), and human and social services (8%). Recognition is important, but many North American donors do not want to see resources (such as paper) wasted in the process: 68% prefer to be thanked for their donations by email, 20% by print letter, 5% by print postcard, 3% by social media message, and 3% via text message. The survey noted that the influence of email- and website-generated donations in North America makes a .org domain more important as a rusted source, as 73% of respondents report they trust the .org extension—the highest percentage among world regions. North America also has the highest rate of Baby Boomer donors (41%) and donors who have charitable giving in their last will and testament (20%), the survey found. While each target donor broken down into very specific subsets. Big-picture surveys such as GTG can help, but the most accurate read comes from analyzing your own donors and prospective donors, and detecting unique trends. If you don’t know where to start, give us a call—we’d be happy to sit down with you.